I had only three other climbers with me on this particular attempt. I prefer climbing to the top in one day. One climber was an eager kid, with lots of energy, but deficient equipment. Another was an experienced climber, but slow. The third was like a rocket. We started at our usual 5 a.m. in the morning. The rays of the rising sun lit up the clouds in a spiritual moment. From the road end at the old ski resort, about 7,800 feet elevation, we hiked on frozen snow up toward the spur ridge. We crossed over it at some 9,000 feet elevation into Avalanche Gulch, which is the main route to the top. Starting from the ski area saves about a thousand feet of gain, as opposed from starting at Bunny Flat. Passing by the standard campspot at Helen Lake, we put on crampons. The snow doesn't get soft till the sun has been on it for sometime. We reached the higher, steeper, elevations as the sun finally shone on us. The slope is said to be about an 35 degree angle. Some climbers have been injured and even killed here. You must know how to use crampons and do self-arrest technique in case of a slip. A falling climber might hurtle along at up to 50 mph if unable to stop him or herself. I have seen very frozen conditions, with bubbles in the water ice. The Forest Service touts this as a "friendly giant." This is in comparison to the big volcanoes of the Cascades further north. This route up the south side of Mt. Shasta has no crevasse danger, if one stays correctly on route. 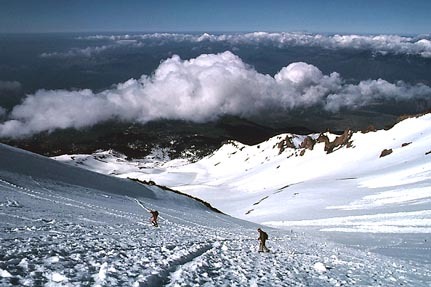 Thousands of climbers achieve the summit each year. As always, the climb itself is sheer drudgery. It is simply one foot in front of the other. It is, again, a necessity to use crampons and ice axe, and cold weather clothing. Although, I have seen extremely fast hikers without the expensive gear, who start up later in the day, when the snow is softer. I recall one kid in sneakers at 13,000 feet! You'd have to keep up a pace of 3,000 feet an hour, or so. The basic tourist route is simple. One just heads straight up. A decision must be made which way to head about the Red Banks, which is a red, volcanic, rock band partially blocking the snow route. Most climbers head around to the right. The Thumb, a rock pinnacle, marks this route. There are a few snow gullies to head straight through. On a spring or summer weekend, there are usually plenty of other climbers for company. Sometimes, there are big, solid footsteps in the frozen snow. We summited in the usual time, about eight hours. One climber became ill from altitude, and had to turn around just short of the summit mass. He carried a big pack, and was well prepared, except for his conditioning. Our trip allows no time for adjusting to the altitude. By the medical people, that requires days of acclimation. You are generally expected to do that on your own time, if you choose to do so. Another climber was happy to take our summit picture. I had a flash unit for myself and the view. I am often employed by other groups on mountain summits to take their pictures. It is somewhat important to have the group shot, or the "proof." Upon the return to the Red Banks, you can usually slide on your seat down the snow. You can lose thousands of feet in elevation in several minutes. The afternoon temperatures usually make the snow mushy and soft. Know how to slow or stop yourself with an ice axe, and don't wear crampons while doing this! Our sitting glissade was fast, but the kid failed to heed my directives to bring nylon rain pants. He brought rain chaps, saying that was good enough. They didn't work very well. Don't use good Gore-Tex pants as they will wear out quickly, and you'll lose your investment! A square of foam pad or stuffed-up insulated clothing makes a much-desired cushion for your rear. I had gotten cold and numb from some of my long glissades, despite long underwear, or insulated pants. So I advise others accordingly. We were back to the car by about 6 p.m., then began driving home. We had dinner in Redding, making it home at about midnight. 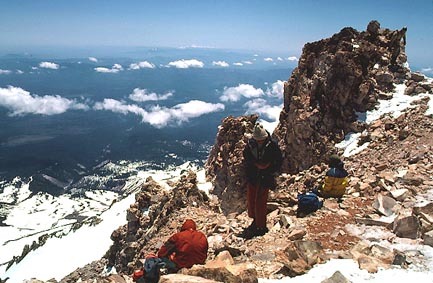 Being my second ascent, I grew confident in carrying on the once traditional and annual Shasta climb for the local chapter. It doesn't take much time, and is a shorter drive than most High Sierra peaks. The main problem is finding participants for your trip. It does take skill and effort to reach the summit. Recent tragic news events doesn't help our sport. For one lead of mine, several in the group turned back. It had taken me three tries before I was finally successful in completing my first ascent, although one failed attempt was due to poor weather. You must be serious in your conditioning to be able to complete this climb! As said, twenty minutes of step aerobics is not enough!